Based in Irvine, California, we focus on manufacturing thousands of components for our broad line of push-pull welding and orbital welding equipment. We are an ISO 9001-2015 certified company and all of our products are 100% assembled in the U.S.A. Some of our products include our line of MIG welding guns; Python®, Prince® XL, Cobra® MX, Cobra SX and the Cobramatic® Push-Pull Wire Feed cabinets, We also have a line of Spool Guns: PXL Spool Gun, Prince SG and the MiniSpool™ gun. As for our line of Orbital tube welding products, we have the CobraTig® 150, Advanced Color Logic®, CopperHead® weldheads DiamondBack® weldhead and the MiniMicro™ weldhead. We have streamlined assembly benches dedicated to each product line, they start at one end and are boxed at the other. We take pride in the fact that we control the entire assembly process from start to finish, ALL of our finished products are 100% tested....no spot checks here! Our engineering department uses all 3-D CAD workstations. These solid modeling computers can design and rotate entire assemblies in real time for precise layout control, they can also show potential errors of interference or tolerances. MK has developed vast libraries of parts which can now be called up and used in when designing new assemblies. This reducing critical design time and makes use of parts that we currently use and produce. The output of these new computers is used to make molds, create new parts and program the CNC machines. They can also output directly to our 3D model printer to make realistic plastic parts right from the computer files. We can literally design a part today and have a working prototype tomorrow. It is people and technology like this which is recognized by both our partners and our competitors as a key factor in making MK a leading authority in the welding industry when it comes to advance designs. We use only the best machines in our plant to increase production capabilities and improve speed whenever possible. Our Mori Seiki NH5000 horizontal Mill can expand to three machining centers in the future with a capacity of 120 tools each, all controlled and interweaved by a main process computer. We currently have many fixed setups that can be rotated into place at any given moment from the large conveyor system, this has allowed us to eliminate virtually all of our machine tooling and setup times. 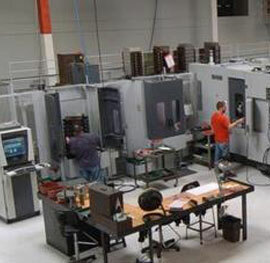 In addition we have many Haas CNC mills and Lathes, our capacity to manufacture parts has greatly increased over the manually operated equipment that we have been phasing out. We also provide faster turn-around on pre-production parts by doing computer layouts right on the floor to help speed products to market. As you tour our manufacturing facility, there is one thing that will be very evident, everything is clean and organized. Dirt is a four letter word here, we have a full time staff that maintains every aspect of the shop environment to make sure that we are always productive and have a safe place to work.